We care about health since childhood! - ООО "Актив Лайф Технолоджи"
A few days ago, a joint project of the Maxim Tank Belarusian State Pedagogical University and the Republican Scientific and Practical Center “Cardiology” of the Ministry of Health of the Republic of Belarus – “Together to the health of the nation” started a joint project. Our company gladly joined this event. We consider it very important to share useful information about the importance of a healthy lifestyle, to teach how to properly monitor your health from an early age. Cardiologists and teachers jointly created special materials for pre-school teachers and primary school teachers. With this information, teachers can successfully conduct informative and useful classes on a healthy lifestyle with children of preschool age and younger students. Materials are developed in the format of media classes, which makes them interesting and memorable for children. In just a week, we took part in 5 events that were held in secondary schools in Minsk on the basis of children’s camps. 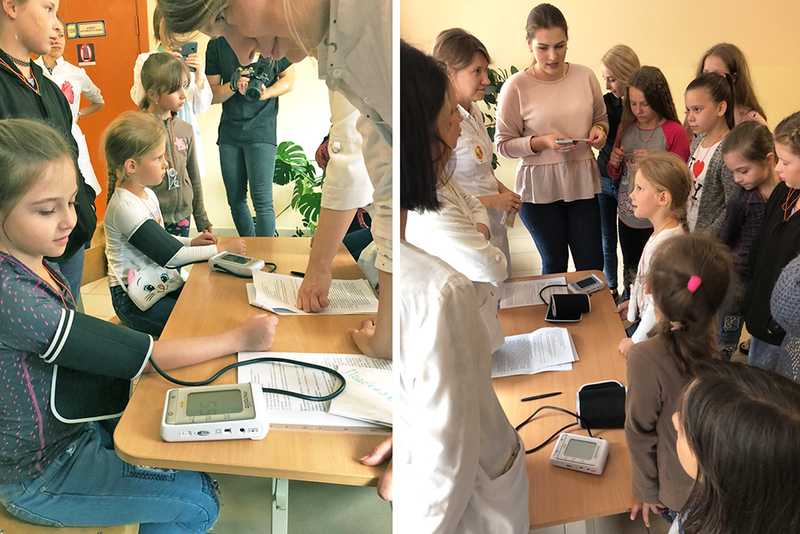 Children were happy to measure the pressure and remember what “correct” numbers the BP сuff should show, asked many different questions about what to do in order to be healthy. Taking care of yourself and your health is a habit that has to be formed from childhood. This we will do!